If you change your city, items in your cart will be removed. How many wheels do you want to Balance? How many wheels do you want to Fit? How many wheels do you want to inflate with Nitrogen? Oops! You did not finish the payment in the alloted time. Congrats, your Appointment has been successfully rescheduled. You can only cancel your appointment after midnight. You can only reschedule your appointment after midnight. mark this order as fulfilled? You have selected a front tyre. You have selected a rear tyre. You can choose tyres/services for only one Make/Model at a time. If you continue the Cart will be reset. You already have items in your cart. If you continue the Cart will be reset. !Are you sure you want to use a visit? Introducing STAMP, an exclusive Annual Maintenance Contract for your tyres. Check out our value for money packages now!
! Want to check out STAMP, our comprehensive tyre-care solution? 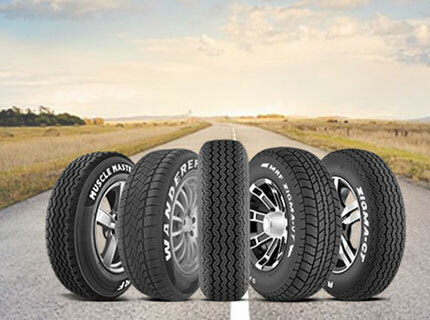 Every MRF Tyres & Service outlet stocks the entire range of 2 Wheeler, 4 Wheeler, commercial and special purpose tyres. Note* ‑ Currently you can buy just the passenger car/ two wheeler tyres online. 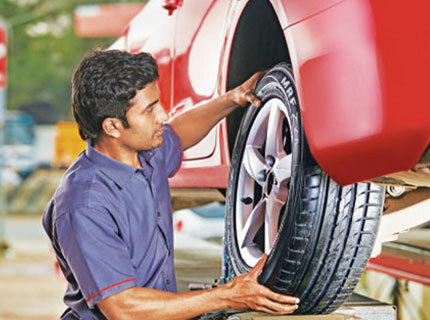 MRF Tyres & Service outlets have state‑of‑the‑art machinery for tyre fitment, wheel balancing, wheel alignment, tubeless puncture repair and nitrogen filling. MRF Tyres & Service outlets have the best‑in‑class service as every technician goes through a 45 day training session at our central training center in Chennai. Random checks are done to ensure that you experience the highest quality of product and service delivery at our outlets.